One of the first phones to launch straight to Windows Phone 8.1, the Lumia 630 is also the first to bring dual-SIM support to the platform. That said, we should note right at the start that we're reviewing the regular, single-SIM version. The difference boils down to just an extra SIM compartment though. There's nothing on the outside to set them apart - the SIM card slot(s) are under the battery cover. Also virtually identical is the devices' LTE version, also known as the Nokia Lumia 635. For the purposes of this review, we'll be treating the three variants as one and the same except where otherwise noted. Anyway, the brand new software version and optional dual-SIM aside, the Lumia 630/635 is nothing out of the usual if you've been following developments in the Nokia low-to-midrange. We can think of at least a couple of phones that have served as an inspiration. Everyone at Microsoft would be delighted if the three versions of the Lumia 630 combined come close to matching the sales of the Lumia 520. The Lumia 625 has contributed too - perhaps with a lesson learned. Not much point stretching the screen too much when the resolution simply can't keep up. The Lumia 630/635 does well to reduce the diagonal but boost screen quality with the ClearBlack technology. 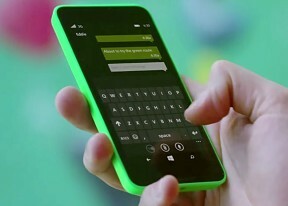 So, the Lumia 630/635 brings a relatively big 4.5" ClearBlack IPS display of FWVGA resolution. It's powered by the popular Snapdragon 400 chipset with a quad-core processor, and runs Windows Phone 8.1 with Nokia Cyan right out of the box. Let's see what else is on offer. Windows Phone 8.1 has finally caught up with the competition and offers some long-awaited features such as Action Center with notification and quick toggles, customizable tile size and Start screen background, the Cortana voice assistant, Quiet Hours mode, install on SD card and a swipe-able keyboard among many others. We'll get into the details in a bit. Of course, there are a few things missing in the Lumia 630/635, which is a budget phone above all else. There is no LED flash or front-facing camera - these are things you can get in the Lumia 625. There is no headset in the retail package, and half a gig of RAM could potentially rule out some apps - or at least they won't run as fast and smooth as you like. Still, Windows Phone should be perfectly capable of making a nice impression on the kind of hardware that powers the Lumia 630/635. This phone was never meant to impress with speed and multitasking prowess - it's supposed to deliver a reasonably smooth and enjoyable smartphone experience to as many people as possible. We don't see why it cannot be as successful as the 520, but we won't take anything for granted.